We Only Live Once Fido! 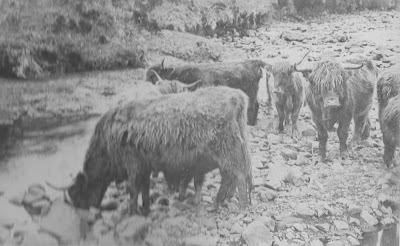 Highland cattle reared on the Isle of Skye were made to swim to the mainland then driven along the drovers' road to the Market at Kinlochhourn. Then after that could be driven much further to their final destination. They are a hardy breed, well known because of their long horns and wavy fur. They have withstood the long cold winters of Skye for many generations without having to go inside, so maybe a sea swim and long mainland trek was no great hardship to them.